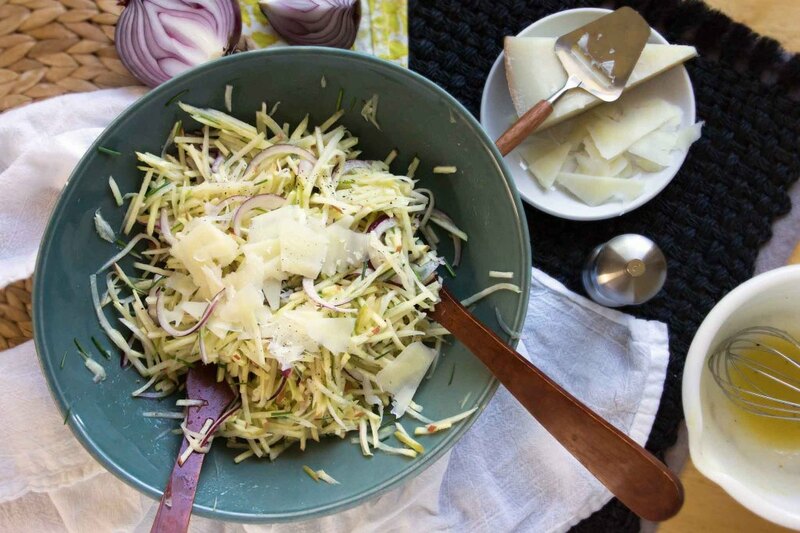 To make this slaw, you’ll just need a few kohlrabi, an apple, chives, and red onion. 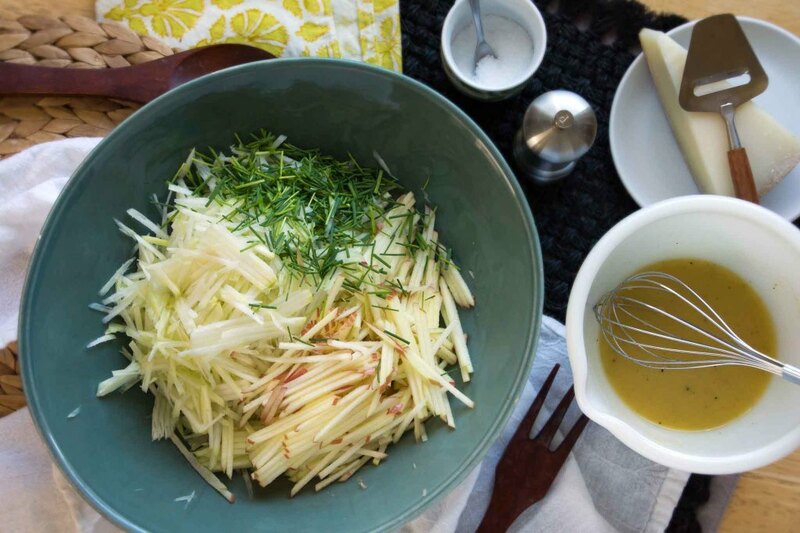 Julienne the kohlrabi and apple (have I told you lately how much I adore my mandoline?) and toss it in a bowl. 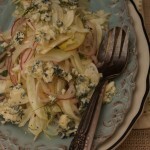 Add chopped chives and shaved red onion, then whisk together a honey-dijon vinaigrette, and give the salad a good toss. We’ll add a final dimension with a handful of shaved cheese. I used a local aged sheep’s milk cheese that I’m in love with, but Manchego or a good parm would do the trick too. Since this was my first go around with kohlrabi at home, I just made the slaw for the heck of it and ate it over a pile of arugula. Next time I make it, I have a feeling it’ll be next to a slow-roasted pork shoulder or something of the like. Serve this slaw aside something rich, like slow-roasted apple cider pork shoulder. Or pile it on a sandwich or grilled bratwurst. In a small bowl, whisk together the mustard, honey, and vinegar. While whisking, slowly pour in the olive oil, whisking until the dressing has emulsified. Season with ¼-1/2 teaspoon kosher or sea salt and black pepper. 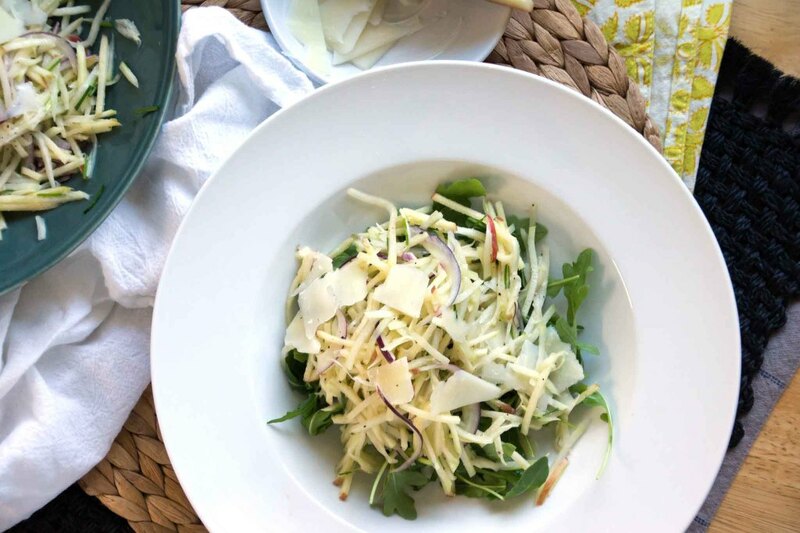 Toss the slaw with the vinaigrette. 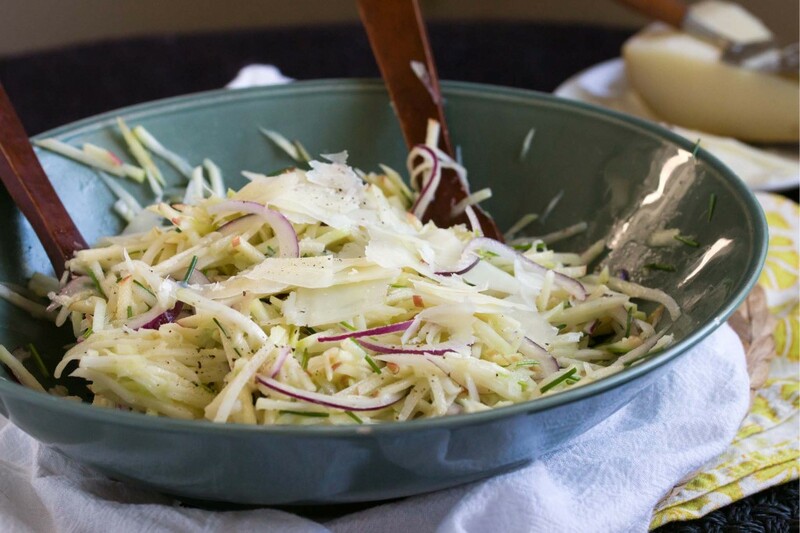 Using a vegetable peeler or cheese plane, shave the cheese over the slaw and serve. I really must try this. 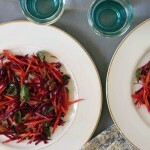 I had never heard of kohl rabi until Paul introduced me too them. He loved them just sliced and raw, but I’d be willing to bet he would like this salad! It really tastes like cabbage heart and we kids would argue over who got to munch on them when Mom made slaw. Yes, I can’t believe how long it took me to start using kohlrabi. I’m sure there will be plenty more in my kitchen this fall and just sliced, raw, and sprinkled with a little salt sounds perfect! 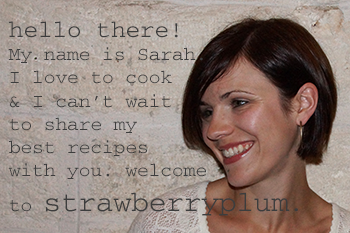 This sounds so good Sarah! Will have to make very soon. I love kohlrabi! Thanks for the recipe. You’re welcome Robin, hope you like it! 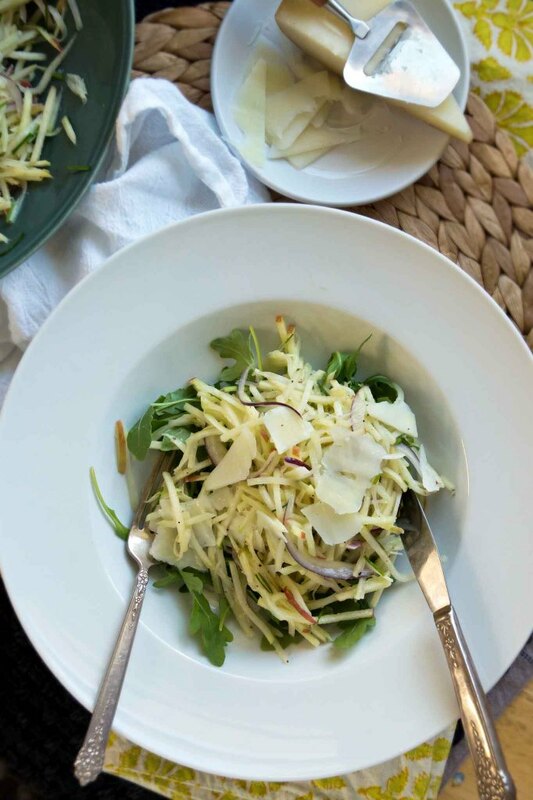 I use kohlrabi often when it is in season – this recipe looks great – funny I was just talking to a grower about it yesterday and said I hadn’t seen much here (NZ) this last season and he said it hadn’t been a good season – oh well will have to wait until next winter to try this recipe. The Oh My Veggies Potluck site directed me your way. I love kohlrabi but no one ever seems to know what it is! I grew up eating it raw(sliced of course! not like an apple…) but I never paired it with apple. This sounds just splendid. Thanks for sharing! You’re welcome–glad you found your way over! That is a great idea and I LOL about the aliens – I always think of UFOs when I see them.. I should pick some up at the farmers market this week, I just never knew what to do with them! I know! I think I’ll try roasting or sautéing them next time around. 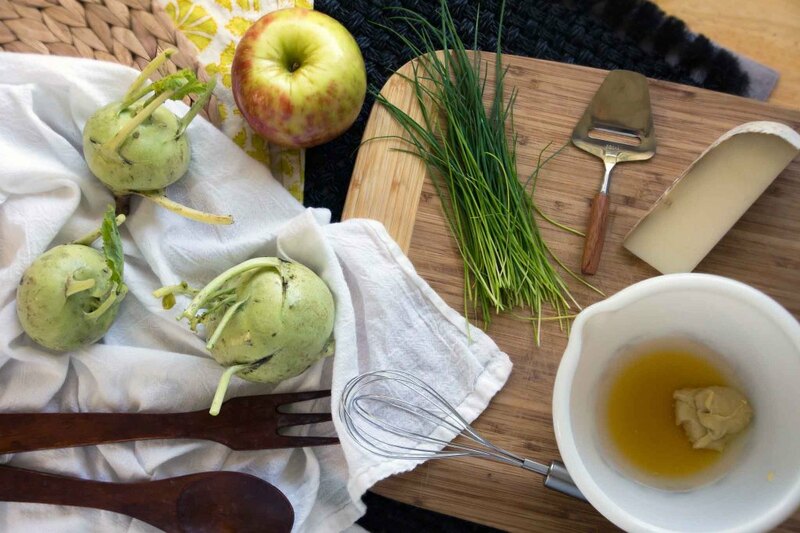 I love kohlrabi and have to try your version! As someone from the ‘old world’, I grew up with kohlrabi. In the traditional northern German kitchen you peel it, cut it into small sticks or slivers and boil it in little salted water with some added milk (to bind the cabbage odors). You serve it in a Bechamel sauce (using the cooking liquids) and season it with pepper, nutmeg and maybe some more salt. Sprinkle with some chopped parsley. As a typical peasant dish it’s served with boiled potatoes and smoked meats or dry cured ham. Comfort food for a rainy day…. Wow, that sounds delicious! I’ll have to give it a try and you’re absolutely right–sounds like just the thing for a cold, rainy day! Sarah, I noticed you haven’t posted in a while. Just stopping by your blog to let you know that I always enjoyed your recipes and I look forward to more whenever you return to blogging. Best of luck! Hi Nicola. I haven’t meant to let so much time slip by between posts. I just started a new job and my hours are now more demanding. I don’t intend to give up my blog (in fact I really miss it!) but the posts are going to be a little more sporadic now. Thanks for your kind words. 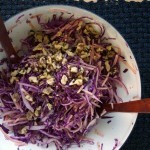 Made the shreds of kohlrabi and apple with a sprializer. Only used half the dressing and seemed way too wet.i served obsessed the arugula and it worked. Excellent taste.